Big Leather Couch: Happy Birthday Matt! did I get ya yesterday? Twenty-two years. So much has happened in that time span. I have moved 4 times in that span. I have had 7 jobs and have been out of work for about 3 years. I have gotten divorced, and have found the most perfect woman. I began a blog and met so many wonderful new friends. I began a food blog and keep making new friends. The one constant is that 22 years ago today, Matthew Vincent Marini was born! The greatest day of my life. He has brought me so much joy and love it is hard to put into words. Matt is now a Junior in college. He continues to work for PP&H as an instructor and loves working with the kids. Two years ago, I did a special post for Matt. If you are a newbie around here, I encourage you to go read it. I happen to think it is one of the best posts I have ever written...but then again, I am a tad prejudice on this subject! 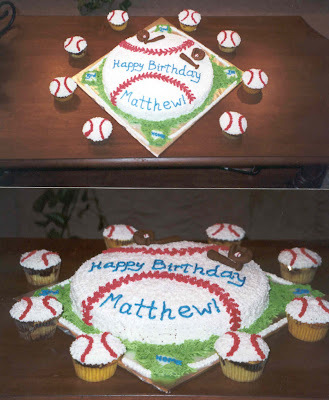 Happy B-Day to the Matt-Man. Ha, I like saying that. Cheers Vinny!! I didn't realize that "your" Matt and my "Tyler" were so close in age - only 9 months difference. I have been amazed at what a joy it has been to watch Tyler become an adult. I'm certain you feel much the same way. Terrific job with the video! Happy Birthday Matt! MATT-MAN: Of course you like it! Happy Birthday, Matt! You're lucky to have such a loving dad and wonderful role model. I remember that post from a couple years ago, Vinny. It made me cry then and pray that, despite the odds, my baby would grow up with a strong role model the way your Matt did. Re-reading that post today, I can honestly see much of what you describe in the young Matt appearing in my son. I just realized that B-man has his strong role model in me, Vinny, and it's partly due to your words and example. You have made a huge difference in the lives of at least two people that you have never even met face to face. That is extraordinary. Thank you, my friend, for your encouragement and support when I needed it the most. Happy birthday to Matt!!! Have a wonderful day! Great work with the video. Happy Birthday Matt! I love you so much! Wish we could be together today. Have a great day! May all your wishes come true. Happy Birthday Matt. I hope that you have a great weekend, and enjoy it to the fullest. Vincente, you are sooooooo very blessed in your relationship with your son. Your love and devotion to him is very apparent in all that you say and do, and Matt's love for you is obvious, too. How incredible for you that your life has taken such a marvelous turn and that Matt is there to share it with you. Your children get bigger and bigger, but we parents never lose the affection for our kids. You are blessed, and Matt has picked up on the values that were once yours alone, but are now shared. Congrats! MARYT/THE TEACH: Thanks and sorry for the scare! Happy happy birthday to Matt!! what a fine young man. Ya done good, Vinny. Mine is injured...AGAIN. We need our own exam room at the ortho clinic. I forgot to comment yesterday after playing the video. Happy Birthday "Son of Vinny". That song stuck in my head untill lunch. KATHERINE: LOLOLOL...I am sure Matt would not have minded if you had gone Mrs. Robinson! STARR: Thanks...You need to wrap her in bubble-wrap I think! P.S. Love the song you chose to go with the video..Matt has your eyes! Happy birthday to Matt. The video was terrific, Vince. You're a lucky guy.